Vancouver is a busy seaport city on the island of British Columbia (BC) in Canada. It is densely populated and home to many diverse cultures from around the world. Its beautiful scenery and eclectic architecture attract thousands of visitors all year round. 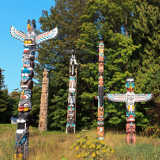 Some of the most popular attractions include Granville Island, Vancouver Art Gallery and the Science Museum. 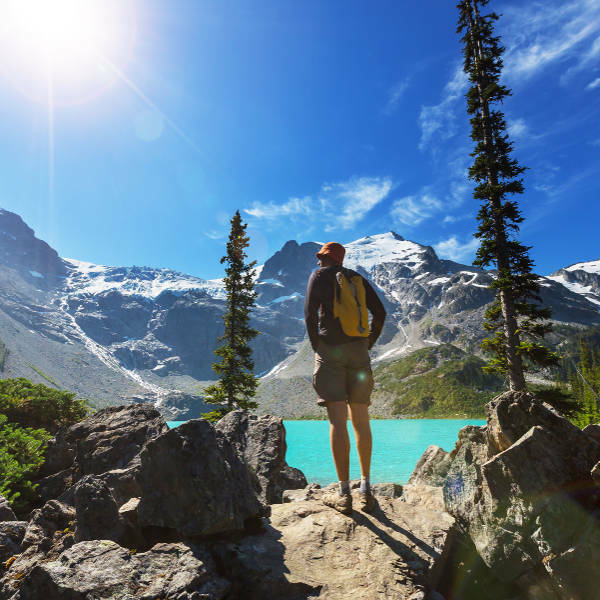 Cheap flights to Vancouver are now available for a limited time only, so book your flight today and experience the natural beauty and cultural diversity this lively city has to offer. Vancouver is home to Vancouver International Airport (YVR), which is a 20-minute drive, or 30-minute train ride, from the city centre. The city can be viewed from the top of the Vancouver Lookout or along the suspension bridges stretching through the lush fern forests. Both day and night offer spectacular views. Landmarks, including the Vancouver Art Gallery, Jimi Hendrix Shrine, Waterfront Station and Steam Clock are just some of the features to see in this fascinating city. Water sports such as kayaking, snorkelling and white water rafting will excite your wild side, as well as nature trails and hikes through the beautiful parks and mountains. Any time is a great time to visit this exciting city! 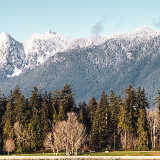 Winter falls between January and March, where many locals pull on their boots and head up the ski slopes. Spring sets in from April to June, when universities close and families take advantage of the outdoors. Summer sees many art and music festivals come alive, and in the months leading up to Christmas, the city is abuzz with festive cheer. 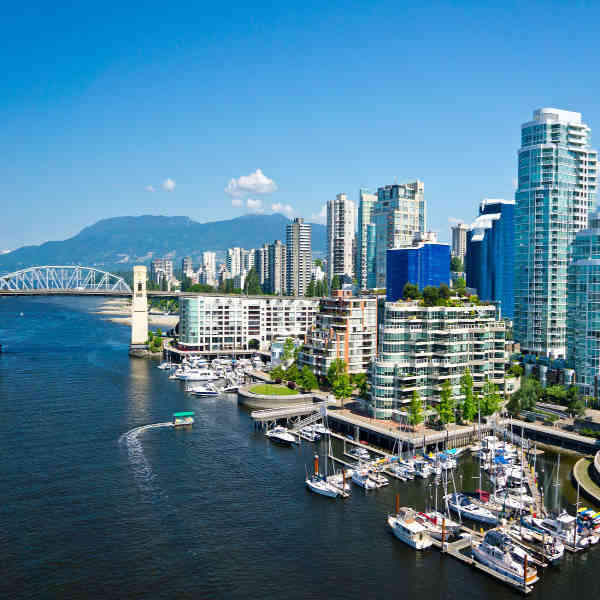 Vancouver is a coastal seaport city on the island of British Columbia, famed for its impressive architecture and bustling art scene. Regardless of when you visit, you will never be short of things to see and do. 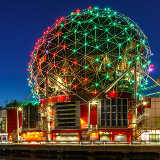 This city is bursting with attractions, ranging from old attractions like the Marine Building, to modern ones like Science World. Set against the backdrop of snow-capped mountains, the city’s skyline and breath-taking views will leave you feeling stimulated and rejuvenated. After a busy day of taking in sights like the Vancouver Art Gallery and the old Steam Clock, you may find yourself taking a leisurely stroll through the serene parks or enjoying the sunset at English Bay. The city is equally thrilling by night, as the quirky cafés and art scene come to life. Whether you’re an adventure lover or looking to be inspired by its creative culture, Vancouver definitely has something for everyone! Compare several airlines, and book your cheap flights to Vancouver online at Travelstart! Vancouver is one of the safest cities to live in. It is a very accessible city and is easy to get around. Like all big cities, small-scale crimes do occur, so be vigilant with your personal belongings and do not leave your items unattended. If you decide to venture outside the central region, be careful of Downtown Eastside, just north of Chinatown. It is not a violent neighbourhood, however it is a hub for many homeless people, prostitutes and drug addicts. The area is under new development, but try to avoid walking around on your own. Should you find yourself ill or in need of medication, you’ll have no trouble finding a health clinic or well-stocked pharmacy nearby. Should you require immediate medical attention you can call the UBC Hospital Care Centre at (+1) 604 822 7222. If you want to be in the middle of the action, with access to cool bars and interesting attractions, make your way Downtown and mingle with the locals. 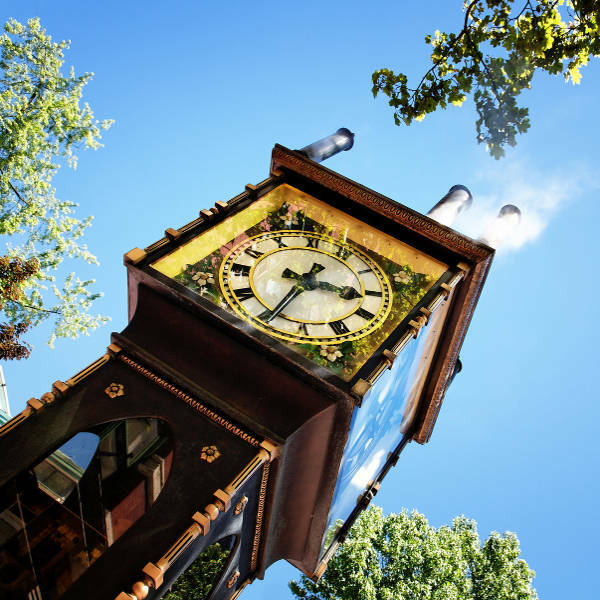 Another popular area for tourists is Gastown/ Railtown for a more edgy vibe. Only 15 minutes away from lively Granville Street, this is a hotspot for youngsters, where many trendy restaurants and clubs make for a fun night out! The gritty old London feel of this neighbourhood stems from its old brick buildings from the early 20th century. For something more upscale, Yaletown is teeming with many high-end restaurants and is conveniently located close to the Skytrain station. North Vancouver is a quieter area, ideal for couples and families, with Lower Lonsdale being pretty and vibrant. A Seabus ferry gets you downtown in 15 minutes. Getting around in Vancouver is easy as the public transport network is extensive. Ideally, you don’t want to stay too far from the Skytrain lines, and there are three to choose from depending on your location. The Canada Line is your best bet, as it travels from the airport to the major tourist areas around the city. The Seabus (public transit ferry) is a great option to get you between Downtown and North Vancouver, while the public buses are also reliable. Taxis can work out to be quite expensive (unless you’re a group), so try to stick to public transport as far as possible. Fares are zone-based, but you can save some money by buying booklets of Faresaver tickets. There are also day passes available, which are good options if you plan on travelling extensively during the course of a day.